The Princeton Review's Guide to 353 Green Colleges: 2015 Edition profiles colleges with the most exceptional commitments to sustainability based on their academic offerings and career preparation for students, campus policies, initiatives, and activities. New to the 2015 edition is a ranked list of the "Top 50 Green Colleges" on which UC Santa Cruz captured the No. 32 spot, third highest in the UC system. UC Santa Barbara ranked No. 3 and UC Irvine ranked No. 16. Lewis and Clark College in Portland was named No. 1. The ranking is an endorsement of the campus’s comprehensive approach to sustainability that encompasses education, food, transportation, waste reduction, water conservation and much more. The campus was also recently highlighted in the 2014 Higher Education Sustainability Review for its efforts on water reduction and student engagement. Information on the qualities and attributes that make UC Santa Cruz “green” are taken from the Sustainability Tracking Assessment and Rating System 2014 report, which records data related to sustainability in teaching and education, operations, and planning, administration and engagement. 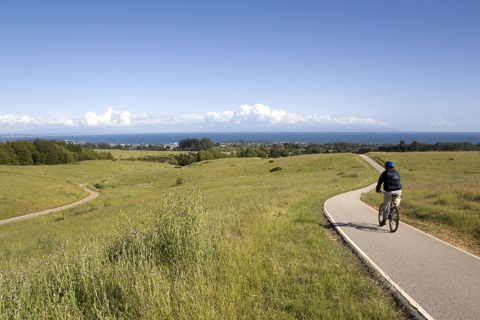 UC Santa Cruz has always ranked high among the most sustainable colleges and universities. Campus efforts are evident in water reduction and transportation as well co-curricular education. "Among nearly 10,000 teens who participated in our 2015 College Hopes & Worries Survey, 61 percent told us that having information about a school’s commitment to the environment would influence their decision to apply to or attend the college," said Robert Franek, Princeton Review's senior vice president and publisher. "We strongly recommend the schools in this guide to environmentally-minded students who seek to study and live at green colleges."